If you find yourself searching for a job in the future, you might come across advice based on the research of Christopher Budnick. Budnick has researched goal setting techniques and implementation intentions – motivation — for the unemployed as they search for new work. In today’s volatile job market, it’s important work. The National Science Foundation agrees. This prestigious foundation awarded Budnick a Graduate Research Fellowship, funding his work. Budnick knows about goal setting and motivation on a personal level as well. The native of Ottawa, Illinois has served in the U.S. Army Infantry. He worked his way through his undergraduate degree by holding down many odd jobs – from a night audit clerk in a hotel to pollinating corn. 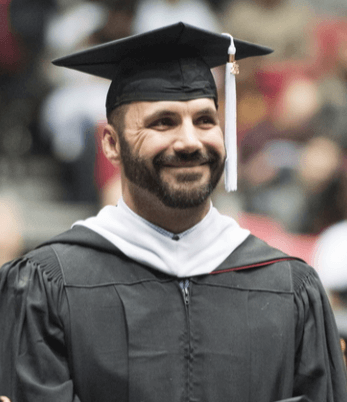 A non-traditional student at age 36, Christopher says he has relied on the patience and understanding of his family – his wife and children, ages 10 and 2 – throughout his education journey. Earning his master of arts in industrial organization and social psychology Dec. 12 was the next step along the way to achieving his Ph.D., a goal he has set for spring 2017.